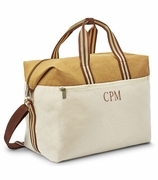 Monogrammed Weekend Bag � Medallion. Carry this popular pattern for your weekend travels with this beautifully constructed duffle style tote bag for overnight. Fashionable pale blue, white with navy trim. Easy clean micro-fiber. Two outside zip side pockets, one front zip pocket, adjustable over the shoulder carry strap. 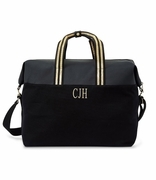 Items include monogram or name with purchase. 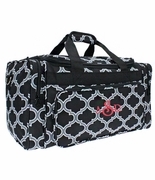 Embroidered weekend quatrefoil duffle bag measures 20�W x 10.5�H x 10.5� across reinforced bottom. Zipper closure. Came sooner than expected even though it was just before christmas! Perfect size for my grandaughter. Quality couldn't be better and the price was more than reasonable? The item arived quickl. It seems high quality. The embroderiy is bold and easy to read. I'm very delighted. Love this bag. It's big, has lots of little pockets. The fabric is bright and soft. The monogram is perfect. Love my new weekend bag. If you are mulling over buying this, just purchase it and I promise you will be highly satisfied.